I assumed this was a late 1950s pattern, due to the styling. However once I opened the envelope I found a piece of newspaper, used for the front facing. A little detective work showed this to be from March 1960. 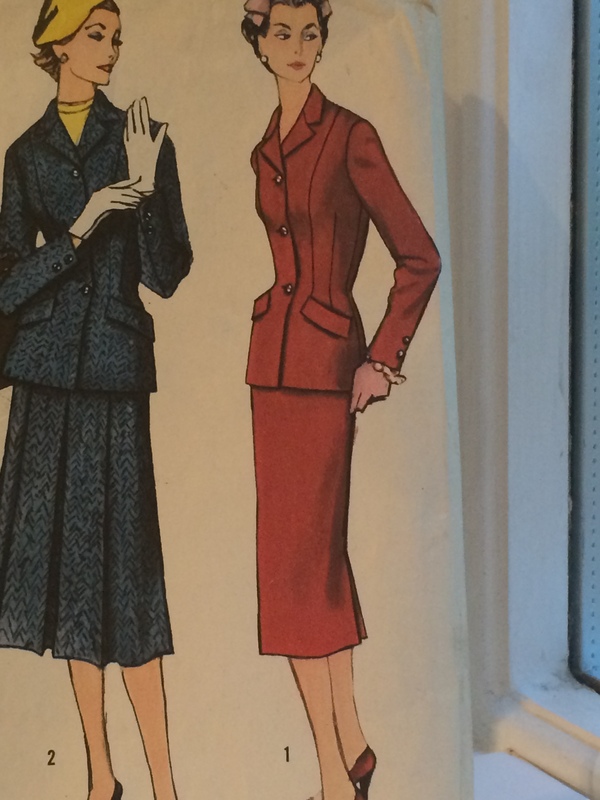 Undoubtedly this pattern is from the late 1950s, probably 1959 but it could be 1958. It is a classic shape and referred to on the packet as a “misses’ and women’s two piece suit with two skirts: attractive town or country suit”, with a ‘fifties vibe rather than a 1960s look. Probably more for a Woman than a Miss. I like the styling on the envelope – a pink bow hat with the rust suit (town?) and a lemon beret and jersey, white gloves and navy bag (country) with the blue tweed number. This is a s12 (32inch bust) pattern which will fit well across the shoulder and lapel. The bust itself may need a little extra and the hips certainly do. This jacket definitely needs toileing, as the fit is everything in such a plain, close-fitting jacket. Also while the fit will probably be good in the shoulder, neckline and waist the bust and hip will need letting out. The pattern is essentially a princess line pattern, with seams dividing the front and back into two sections vertically. So I added half an inch to the back panels below the waist and half an inch to the front side seam. This should do the trick. Also I may need to make the jacket shorter or longer to achieve balance, but I will make it up in the regulation length and then try it on with various skirts and trousers before deciding on this. The particular design involves a pocket that stands out a little at the front, emphasising the hip curve and minimising the waist. It is a similar pocket finish I made on my Vivienne Westwood style jacket. When making the alteration I wondered where to add the hip width, worrying that I might increase the pocket gape rather than adding fullness in the hip. The construction is a little bit complex, so I pinned the pattern together to work out what the designer had in mind. I added half an inch to the side seam, beyond the edge of the pocket and hoped for the best. I could have slashed and spread closer to where the princess line would have come, had it been there, but this would have mucked up the pocket. Also when adding width or length to a garment we don’t always get it in the right place. For example I generally need a longer torso but it is sometimes needed above the bust and sometimes below. With width I need it much more at the back and sides, and not much at the front. So a toile allows us to move the fullness to the place it is needed. With a panelled jacket there are a variety of places to let it out, 13 to be exact (nine vertical style lines, plus four darts). At the moment I am guessing, and will try to ensure the jacket is balanced during the fitting stage. As you can see the pocket shape allows me to put a reel of basting cotton into it, and this allow at least the fingers to be put into the pocket. The pocket bag is disappointingly small and while this is surely designed to keep the bulk down, I will consider making a much bigger pocket in the final version. It might be a 1950s jacket but I need somewhere for my mobile phone! This photograph shows I have added half an inch to the length where specified. This may not be quite the right place for me – I am tending to find I need the length above the bust, but when I pinned the pattern together and tried it on I found the bust point was in the right place. But paper is not very good for testing fit, especially with older patterns where the paper is more fragile. The fit over the bust – along the front princess line – will be the crucial fitting point when we come to examine the toile. Also I decided to tape the ancient newspaper cutting to the centre front, allowing me to create a grown on facing rather than having a join. I forgot this idea until I read a comment kindly left on my blog by Annie. It is a great way to reduce bulk, although it may be less economical on your fabric. 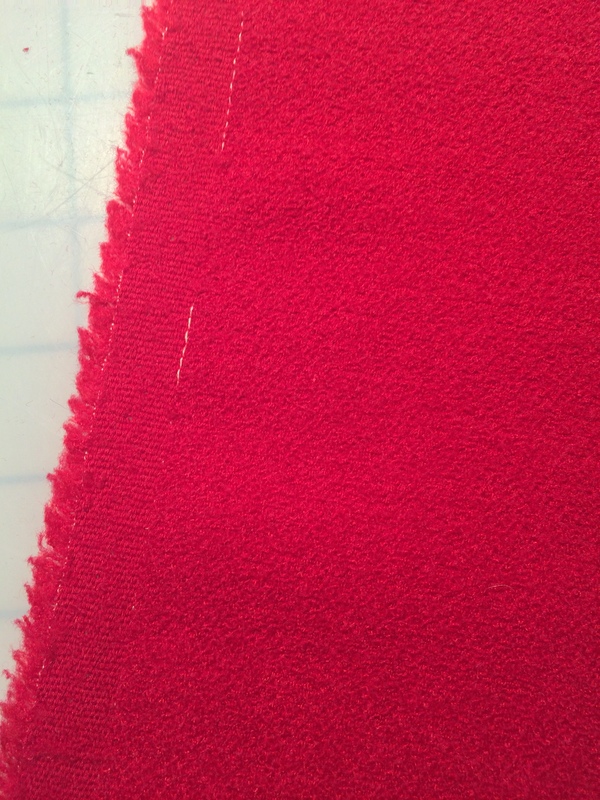 I have a nice red polyester wool available for this project – rather inexpensive. It is a little lightweight compared to the charcoal pure wool I plan to use on my final item. However it is a nice slightly boucle finish (which, irritatingly, will probably catch) and I shall enjoy using it. 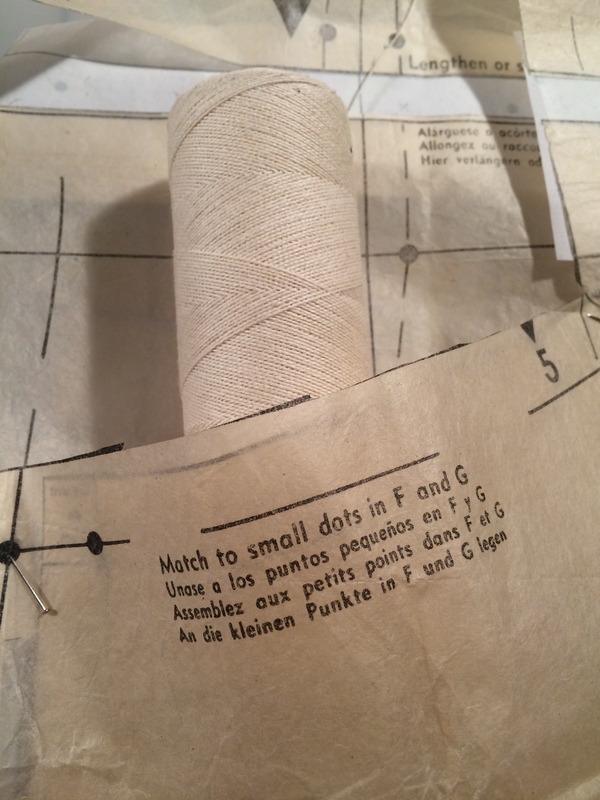 I will use cotton organdie as the interfacing, cotton tape for taping, and some vintage buttons I found recently. I will move on to fitting the bodice and will report on progress in a few days. Thanks for the detail, Kate. This is very helpful for a novice such as me. It’s neat to see thinking at work matching ideas to an actual design. Great! Agree about the pockets – those shallow pockets have always annoyed me about my vintage jackets. Popping out of hibernation here to say thanks for the shout out. I’m still reading and following your Swap with interest as I too am currently planning items that will coordinate and mix and match. It does help to see what considerations are informing your final choices, so many times I have been seduced by styles and fabrics that just don’t work together or are wrong for my lifestyle. With workwear in mind I made some m&ms Factory Dresses and have pretty much worn them to death since, a Paco Peralto coat, nah, stopped half way through as it was too warm, too heavy and I knew I wouldn’t wear it. Planning is key, that needs to be writ large above my sewing machine!